We all have those days when we feel fat and bloated. To look and feel your best on your fat days, check out these figure-flattering and comfortable fashion choices. Years ago, Angelina Jolie popularized the maxi dress when she was pregnant and the style has remained trendy ever since. The maxi dress features a loose, flowing skirt that hides any figure flaws and still makes you feel beautiful. 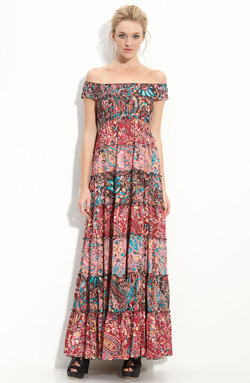 Bohemian-inspired maxi dresses in fun prints are perfect for your fat days. Just slip on your maxi dress and your favorite sandals — you’ll be out the door in no time. Cropped or waist-length tops and jackets aren’t your friend when you are feeling fat. Instead, reach for a tunic-length top that hits at the hip. 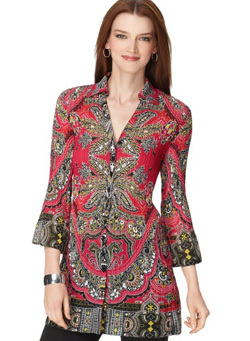 Tunics are trendy right now when partnered with skinny jeans. Just make sure that your jeans have a bit of stretch to them so you’ll still be comfy. Fortunately flared skirts are hot right now, from subtle A-line shapes to big, full skirts. No matter your length preference (mini, midi or maxi), you can find flared skirts in beautiful fabrics. Consider a skirt with a high waist to disguise any stomach pooch. Oversized cardigans and roomy dolman sleeve sweaters are fall staples that are ideal for those days you are feeling a bit fat. 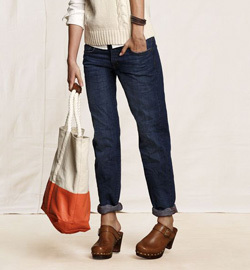 Choose a sweater in a cozy, soft knit and partner it with slim straight leg jeans. The iconic wrap dress made famous by Diane von Furstenberg is flattering for almost any figure type. Select a wrap dress in a jersey knit with a knee-length skirt to create a long and lean silhouette. For casual days, pull on your favorite pair of jeans and an oversized tee. Relaxed fit jeans with a little extra room in the tummy, hips and thighs are just perfect. Cuffed boyfriend jeans emerged on the fashion scene a few years back and they are still a popular choice today. By picking the right clothing, you can still look stylish even when you feel fat. When getting dressed on your fat days, pay attention to accessories. A big handbag can make you feel smaller. Same goes for big, bold jewelry such as a thick cuff bracelet, chunky cocktail ring or statement bib necklace. Also consider pulling your hair up. Updos make your face look slimmer, so you’ll feel better about how you look.